One of the most popular bass lures ever developed. Now even popular for pike and musky as well as panfish. I have even taken trout on these amazing baits. The Spinnerbait is one of the few truly weedless spinners. It can be tossed into the heaviest cover and still not get caught up. If you only use a few dozen baits per season, purchase the spinnerbait heads pre-made and perhaps even painted. If you go through more, you may want to mold your own spinner bait heads to save even more. Spinnerbaits come in realize that spinnerbaits are rather easy to assemble from an assortment of components. In fact, spinnerbaits are perhaps one of the easiest of lures to assemble. No special tools are required and you can assemble a seasons worth of spinnerbaits in a few hours. Before we actually get to the steps of putting together spinnerbaits, lets take a closer look at the spinnerbait forms (wire). There are several styles of line ties and modifying the upper or lower shaft will directly modify how the spinnerbait will perform. Lets look at a few variations. Tandem Spinner bait many sizes with the 1/8 oz., 1/4oz., 3/8oz., and 1/2oz. being the most popular sizes. Spinnerbaits are extremely easy to assemble. The figure on the right shows the different components used making spinnerbaits. There are two popular line ties in use today. The twisted eye and the "R" Bend eye, both offer advantages. The "R" bend is an easier bend to form and has become more popular with some manufactures. Anglers using spinnerbaits with an "R" bend quickly realize that you can't use a snap to attach it to your main line. 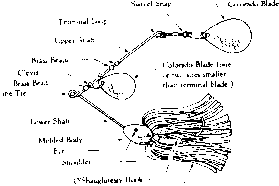 The snap will slide up or down the one of the shafts and foul the action of the lure. Some anglers use a piece of latex hook tubing and slide it over the "R" Bend before connecting a snap to eliminate the snap sliding problem. One advantage of the "R" bend whenyou tie your main line directly to the "R" bend you don't have to worry about your line wrapping around the bend and damaging your line as with the twisted eye. The twisted eye is good for use with snaps or leaders because you know the snap is securely locked in the eye and can not slide up or down the shafts. Aside from changing blade and skirts an easy modification to make to spinnerbait is to modify the upper arm length. Most standard spinnerbaits uppershaft length is roughly equal to the length of the lower shaft plus the hook length. Lets look at what happens when you shorten the upper shaft or lengthen it. Look at the spinnerbaits on the right. The top spinnerbait has a regular length upper shaft. The middle one has a short upper shaft and the lower one has a longer upper arm. By changing the upper shaft length you effectively change the position of the blade in relation to the hook. If the shaft is too short it will not protect the hook from snags. If the arm is too long the fish may strike the blade missing the hook. A shorter shaft is great for helicoptering the spinnerbait. Helicoptering is when you let the spinnerbait drop vertically. Use a larger blade Colorado to slow the drop. A longer arm will protect the hook from snags better. I recommend that you modify a few of your spinnerbaits by changing the upper arm lengths. Look over the chart below. It lists the recommended components and their sizes for each of the single and tandem spinnerbaits. The most important thing to remember is that blades which are too large for the spinnerbait will sometimes cause the entire spinnerbait to roll while being retrieved. You may be able to use oversized blades but you may have to retrieve them very slowly to avoid the lure rolling. 2) Blade size for the secondary blade. This blade should be smaller than the terminal blade. It is placed on the upper arm before the terminal blade using a stirrup clevise. 3) The swivel may be a snap swivel or a crane swivel with split rings. The advantage of a snap swivel is that you easily change the blade while out on the water. 4) These are usually hollow metal beads but you may use plastic beads as well. They act as a bearing and should be both above and below the clevise. 5) Use an Eagle Claw style 253 or 255 hook. Spinnerbaits are extremely versatile lures and deserve a place in every anglers tackle box. Experiment with blade colours, sizes and styles as well with a variety of skirts. How to connect the line to a spinnerbait? How to use spinnerbait trout? How to make a r bend for spinnerbaits? How to attach buzz baits on the line? How to tie spinner bait for trout? How to tie spinner baits to line? How tie fishing line to spinnerbait? How to bend eye spinnerbait? What size tubing for spinner baits? Where do i connect line to a spinner?